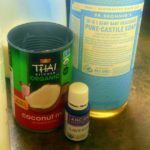 I don’t remember where I found this shampoo recipe last year, but I was in the process of learning the medicinal qualities of essential oils at that time in my tough season of illness. So many of our products sold in stores these days are loaded full of harmful chemicals under long, ambiguous names we don’t recognize as harmful. Since my shampoo recipe includes using essential oils, I thought I should spend some time covering some general information for you. 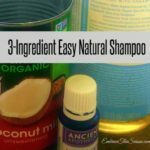 The original recipe for my shampoo probably came from either Dr. Axe or from Dr. Eric Z. Dr. Eric Z at Natural Living Family is an expert, among other topics, on all things essential oils. He shares his knowledge about using oils properly, types of oils and their medicinal properties, applications, and quantities recommended. 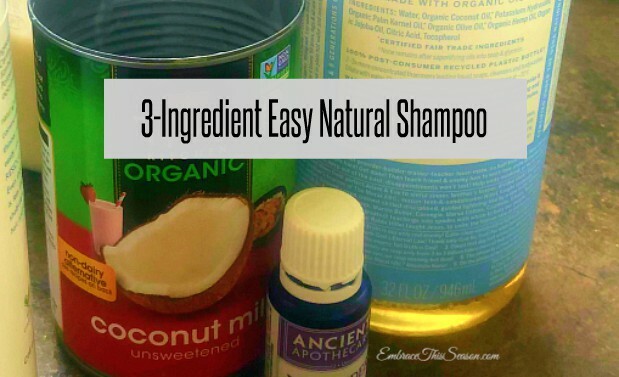 As far as this recipe goes, I loooove using my shampoo. It gives me confidence in harmlessly caring for the (gray ahem, silver – wink) hair that crowns my temple! If you are new to essential oils, you may not know there is a lot of miss-information floating around Pinterest regarding inflated quantities of oils in home-made recipes from random people not properly educated in the use of essential oils. We need to be careful who we trust. When using oils of pure quality, while more expensive, they are much cheaper in the long run when you follow the correct amounts for the different types of use. A little goes a long way – and with maximum, powerful effects. Through testing different essential oil brands, I found a huge difference between the ones that had scents I like and scents I don’t like. Dr. Axe’s oils all agree with me and blend nicely with my own natural scent. My husband also had a definite opinion on the oils I used that lingered too loudly. I don’t like the strong, lingering scents, either – no matter their purpose. A strong scent sometimes signifies a cheap oil with unnatural additives, but that isn’t always true. A strong scent can mean the oil is highly concentrated through pure processing. Check the source, the labeling, etc., for listings of all ingredients, natural and unnatural, and for details on how they process their oils. I wanted to mention Dr. Z’s training. Dr. Z is a terrific outside source with objectivity since he doesn’t sell the oils himself. He promotes essential oils and their use for many purposes for health of body and home. One of my favorite sources for buying essential oils is Dr. Axe. I have a few favorite oils I regularly use, and I recommend trying a few different scents or buying a small starter set. In the end, I had collected all in the starter set individually because all the oils in the set are so useful for many things! At Dr. Axe, you can enroll for automatic shipment for the oils you need on a regular basis. You can set up monthly delivery, every other month, every three months or more – or even pause delivery when needed. Auto-ship gives you a little better pricing for each auto-ship item. You are notified a few days prior in case you need to go into your account and adjust things before shipment. Dr. Axe and his team really have thought of everything! It’s important to buy oils that are made cleanly with an end product of purity. Dr. Axe oils qualify, as do Young Living oils. I’ve heard of others that claim to be good quality, but I haven’t checked them out personally, so I can’t recommend them. Here’s the Facebook LIVE video from yesterday where I share my results from making and dispensing my easy shampoo recipe. I did go on a little too long about it, didn’t I? I wanted to be sure and cover everything and not leave anything out. Next time I’ll make a list – and try not to repeat myself. Ha! I promised the link where you can find Dr. Bronner’s Pure Castile Liquid Soap on Amazon*. (If you follow this link to make a purchase, I will receive a small compensation, and thank you!) I was excited to see the price is less than I remembered. This is the one I use. It’s classified as “baby unscented” and contains 32 oz. And, finally, here’s the printable recipe! 3 natural ingredients combined for a silky-soft lather of freshness, a recipe that lasts for months. Simply shake and use as needed. Stir ingredients together and pour into your desired dispenser. Shake gently before each use. Enjoy for months! PIN this image for reference later. Have you been turned off by strong scents in the products you buy? Do you have sensitivities to artificial scents? *Affiliate link – see disclosure here. Hi and welcome! It's wonderful to have fellow "embracers" during some pretty tough seasons - and some triumphant ones, too. I invite you to enroll to receive my blog posts by email so you don't miss what's coming next. Enroll for Posts by Email and get the FREE 30-10 Praise Challenge pdf download. Healthy Cooking Classes at Craftsy! Receive posts by email here.